Research in EMS is important and leads to evidence based clinical protocols and improved patient care. The Region XI EMS system has a Data/Research Committee that is actively engaged in multiple studies. 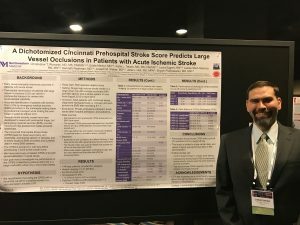 In January 2017, at the National Association of EMS Physicians (NAEMSP) Annual Conference, Dr. Richards-the Associate EMS Medical Director at Northwestern, presented an original research poster entitled “A Dichotomized Cincinnati Prehospital Stroke Score Predicts Large Vessel Occlusions in Patients with Acute Ischemic Stroke”. In a survey of over 2000 Chicago Fire Department EMS providers to assess perceptions on Termination of Resuscitation in a large, urban EMS system, we found that scene safety, death notification delivery, and lack of formal training were barriers and required educational and operational initiatives to overcome. Tataris KL, Richards CT, Stein-Spencer L, Ryan S, Lazzara P, Weber JM. “EMS Provider Perceptions on Termination of Resuscitation in a Large, Urban EMS System.” Prehospital Emergency Care. 2017, May 8:1-6. Most 911 callers for stroke use vague and non-specific words to describe the emergency and lead to difficulty for the Emergency Medical Dispatcher (EMD) to identify stroke symptoms provide accurate information to EMS responders. Richards CT, Wang B, Markul E, Albarran F, Rottman D, Aggarwal NT, Lindeman P, Stein-Spencer L, Weber JM, Pearlman KS, Tataris KL, Holl JL, Klabjan D, Prabhakaran S. “Identifying Key Words in 9-1-1 Calls for Stroke: A Mixed Methods Approach.” Prehospital Emergency Care. 2017 Jun 29:1-6.